50+ Amazing Low-Carb & Gluten-Free Recipes For Your Healthy Ketogenic Lifestyle by Dana Carpender & Caitlin Weeks. The CarbSmart Grain-Free, Sugar-Free Living Cookbook is chock-full of sweet recipes that please the palate and leave you feeling great–without gluten and sugar! Two people known for and dedicated to the low-carb and Paleo lifestyle–Dana Carpender and Caitlin Weeks-have created these wonderful grain-free, sugar-free recipes. Carpender is the author of 20+ low-carb cookbooks including our own Fat Fast Cookbook, while Weeks, known as Grass-Fed Girl, is a holistic nutrition consultant and popular blogger from San Francisco, CA. These CarbSmart.com columnists have collaborated on an amazing collection of recipes that you’ll want to make over and over. Each tasty recipe is labeled by their nutritional category–low-carb, gluten-free, Paleo, vegetarian, vegan, and nut-free, so you can easily identify what fits your dietary needs. They also offer nutritional info, recipe variations, special creator notes, and more. You’ll know the exact breakdown of each recipe because the nutritional info includes serving size, calories, fat, protein, carbohydrates, dietary fiber, and usable carbohydrates. Perfectly refreshing for getting through the summer or anytime of the year! These are just seven of the amazingly tasty and simple recipes in this new grain-free and sugar-free cookbook! 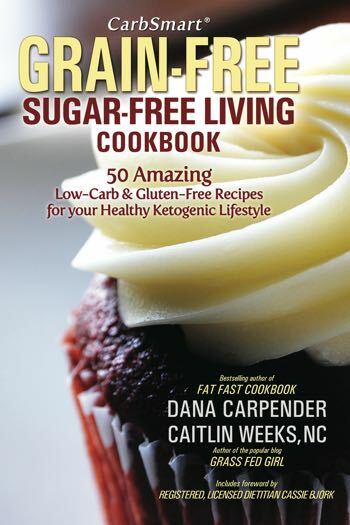 CarbSmart Grain-Free, Sugar-Free Living Cookbook contains exactly what you’d expect from Dana Carpender and Caitlin Weeks–delicious, healthy ketogenic recipes with delicious, healthy ketogenic ingredients. Carpender, who is also author of our bestselling Fat Fast Cookbook is known for her blog Hold the Toast. Weeks, who has been a holistic nutritionist since 2011, publishes at her popular blog Grass Fed Girl. Together, they have used their expertise, creativity, and grain- and sugar-free knowledge to create an irresistible cookbook!